Domaine de Beaurenard is another Chateauneuf du Pape estate that can be called a true, family affair. That’s because the vineyards have been in the same family for 7 generations. Domaine de Beaurenard dates way back to 1695. At the time, it went under the name of “Bois Renard,” which as you might guess, is where the special cuvee, used for both their red and white wines got its name. Today, Domaine de Beaurenard is managed by Frederic Coulon and Daniel Coulon. Domaine de Beaurenard has been producing, bottling and marketing their own wine for close to 100 years. They began making their own wine at Domaine de Beaurenard in 1929. Due to the world-wide depression that was just starting to sink in, this was as you might imagine, a difficult to start a new winery in the Southern Rhone Valley. As you can see, they survived and prospered. Domaine de Beaurenard remains a family run estate. The sons of Daniel Coulon are becoming increasingly involved with the property. Over the next several years, you can expect that Antonin Coulon and Victor Coulon will eventually take over the managing the property. 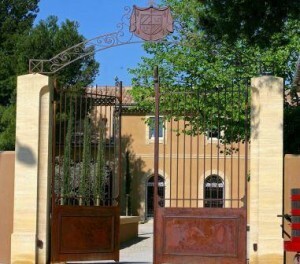 Domaine de Beaurenard possesses 32 hectares of vines in the Chateauneuf du Pape appellation. 28 hectares are used for producing red wine grapes and 4 hectares are reserved for making white Chateauneuf du Pape wine. The vines are located in 25 separate parcels, with much of their Grenache planted in the Cabrieres lieu-dit. They have a terroir with clay, limestone and large stones in the soil. They have old vines, with some of the Grenache dating back over 100 years. Domaine de Beaurenard also owns 15 hectares of vineyards in the Cotes du Rhone Villages, and 62 hectares of vines in the Rasteau AOC. While Domaine de Beaurenard grows all 13 Rhone allowed grape varieties for use in their red wine, the primary grapes used in the blend are; Grenache, Syrah, Mourvedre, Cinsault and tiny amounts of Counoise, Muscardin, Terret and Vaccarese. For their Chateauneuf du Pape Blanc, they primarily use Clairette, Roussanne, Bourboulenc, Grenache Blanc, Picardan and Picpoul in the blend. The vineyards of Domaine de Beaurenard are planted with vines that are close to 45 years of age. At Domaine de Beaurenard, they practice traditional vineyard management and wine making techniques. In fact, Domaine de Beaurenard has organic as well as as biodynamic in their approach to vineyard management since the 2010 vintage. They also plow several of their vineyards using horses. They have taken this a step further here however as they now have their own massal selection program. To create their massal selection, starting in 2007, they took cuttings from each of the 13 grape varieties planted that were considered old vines, (more than 100 years of age) and placed those in a specific 1 hectare parcel to aid in the propagation of their genetic material. In 2004, the winemaking facilities were modernized. At the time, they added several small, truncated, conical, oak vats. With a total of twenty four temperature controlled, stainless steel vats, they are able to vinify on a parcel by parcel basis. After finishing the alcoholic fermentation, the wine is moved into oak barrels for malolactic fermentation. The wine is aged in a three different sized vats, 30 hectoliter foudres, 80 hectoliter truncated oak vats and 228 liter oak barrels for between 9 to 18 months depending on the wine and the character of the vintage. The best vintages of Domaine de Beaurenard are: 2018, 2017, 2016, 2015, 2012, 2010, 2009, 2007, 2005, 2001, 2000 and 1998. Domaine de Beaurenard produces 4 red Chateauneuf du Pape wines, and 2 white Chateauneuf du Pape wines as well as wines from the Cotes du Rhone and Rasteau appellations. Domaine de Beaurenard Chateauneuf du Pape is produced from a blend of 70% Grenache, 10% Mourvedre, 10% Syrah with 4% Cinsault, the rest of the blend is from assorted grape varieties. The vines are on average close to 50 years of age. The terroir is galets, sand and limestone soils. The vines are fairly dispersed in the appellation with plantings in the Beau Renard, le Bois de la Ville, Cansaud, la Cerise, Colombis, la Crau, la Gardine, la Nerthe, la Pied Long and le Pradel lieux-dits. The grapes are fully destemmed. The wine is aged in a combination of vat, used oak barrels, demi-muids and 5% new, French oak barrels for 12 to 15 months. The production is close to 6,500 cases per year. Domaine de Beaurenard Boisrenard is produced from a blend of 60% old vine Grenache and assorted other grape varieties. The vines range in age from 60 to more than 100 years of age. The grapes are 100% destemmed. The wine is aged in a combination of new and used French oak barrels for up to 18 months, giving the wine a plush texture in a modern style. On average, close to 1,500 cases are produced each year. The wine was first produced from the 1990 vintage. Domaine de Beaurenard Chateauneuf du Pape Homerus de Beaurenard is the newest wine from the Coulon family, making its debut its the difficult 2013 vintage. The wine is made from a selection of barrels in the cellar. The blend is on average 65% Grenache, 15% Syrah, 10% Mourvedre, and the comes from Cinsault and other allowable grape varieties, similar to what you find in the standard Chateauneuf du Pape. The wine is aged in a combination of old foudres and oak vats. Domaine de Beaurenard Gran Partita made its debut with the 2012 vintage. The wine is produced from blending a high percentage of Grenache with an average of 10% white wine, grape varieties and various other, allowable grapes. The wine is aged for about 18 months in old foudres and for an additional 6 months in cement tanks. Only 400 cases of this wine are made. Domaine de Beaurenard Blanc is made from 27% Clairette, 26% Roussanne, 25% Bourboulenc and 1% Picpoul with 1% Picardan. The wine is aged in vat for 90% of the production. The remaining portion is aged in French oak barrels for 6 months. Close to 800 cases are produced each year. Domaine de Beaurenard Boisrenard Blanc is made from the estates oldest vines which are more than 70 years of age. The blend comes from 30% Clairette, 25% Roussanne, 20% Bourboulenc, 20% Grenache Blanc, 2.5% Picardan and 2.5% Picpoul. The wine is aged in a combination of new and used, French oak barrels for 6 to 10 months before bottling. The production is quite small with close to 225 cases made each vintage. Domaine de Beaurenard can be enjoyed on the young side. Young vintages should be decanted for 1-2 hours. This allows the wine to soften and open its perfume. Older vintages might need very little decanting, just enough to remove the sediment. Domaine de Beaurenard is usually better with 3-6 years of bottle age. Of course that can vary slightly, depending on the vintage. In the best vintages the wine should be consumed within 8-16 years after the vintage. Domaine de Beaurenard is best served at 15.5 degrees Celsius, 60 degrees Fahrenheit. The cool, almost cellar temperature gives the wine more freshness and lift. Domaine de Beaurenard is best served with all types of classic meat dishes, veal, pork, beef, lamb, duck, game, roast chicken, roasted, braised, stewed, and grilled dishes, sausage, cassoulet, eggplant and tomatoes. Domaine de Beaurenard is also good with Asian dishes, hearty fish courses like tuna, mushrooms and pasta. The white wine of Domaine de Beaurenard is best served with a myriad of different seafood dishes, shellfish, crab, lobster, sushi, sashimi, chicken, pork and veal, as well as Asian cuisine and cheese. Pure, dark black cherries, velvet textured tannins and waves of spice, licorice, plums, kirsch and pepper. Rich, luscious and long, yet balanced, fresh and pure, this is beautifully hedonistic in all the right ways. The wine was made from a Grenache dominated blend with close to 70% Grenahce, that also utilizes old vine Mourvedre, Syrah and all the other allowable grape varieties in the appellation. Ripe, round, lush and juicy, the wine offers sensuous textures and layers of fresh, juicy kirsch and cherry notes. Forward and full bodied, you should be able to enjoy this on release. The wine is produced from Grenache, Syrah, Mourvedre and various other allowable grape varieties. With a bit of smoke, earth, fennel and sweet, red fruits, the wine serves up its juicy, cherry center with ease. Soft, round and polished, this will be great young and should age well too. While dominated by Grenache, the wine includes various percentages of most, or all of the AOC allowable grapes. Smoky, spicy, soft and loaded with sweet, red fruits, black raspberries, thyme, earth and a bit of dark chocolate in the end note that adds to its round textures. Finesse styled, with a focused, soft, red berry center and a smooth, early drinking, spicy, fresh finish. Burnt wood, spice, incense and kirsch notes create the nose. The soft, round fruits and crisp, smoky berries on the palate make it even better. While the blend is mostly Grenache, the semi modern styled wine features various amounts of all 13 varietals. Blending 70% Grenache, 10% Syrah, 10% Mourvedre, 5% Counoise and 5% Cinsault, the wine reached 14.5% alcohol. With a complex nose of herbs, fennel and earthy red fruits, the wine is soft, plush and round, ending with a sweet, juicy, red fruit. A hint of oak is matched with sweet black cherry in the nose and fleshy, plush textures. The wine ends with a touch of oak and round, sweet red berries. Modern in style, I liked it, but others might not like it as much. This blend of 13 varietals turned out to be 14.5% alcohol. With an earthy quality, the dark cherry notes, forward personality and sweet kirsch in the finish leave a nice impression. Ripe, fleshy, polished and fresh, this modern styled Chateauneuf du Pape is filled with kirsch, jam, coffee bean and spice. Generally speaking, I do not like oak with my Grenache. But previous vintages have come together quite nicely with time. I expect that to happen with this as well. Supple, polished, soft, sweet, dark red berries with a forward, modern styled finish. Drink now, or wait a year or two. A hint of oak remains, along with copious amounts of lush, fat, juicy cherries, fennel and kirsch. Rich, round and forward, you can drink it now, if you like it on the young side, or give it more time in the bottle. Lush, round textures, black raspberry, kirsch, thyme, espresso and smoke on the nose, with a sultry, low acid, sweet, ripe, fruit filled finish. This is clearly fun to drink today. Fully mature, the wine offers equal parts of earth, garrigue, smoke and pepper, as it does, very ripe red fruits. Soft and round in texture, the wine is not meant to age much past this point. If I had any bottles in my cellar, I'd look to drink them over the next few years. This is drinking at peak today. The wine is lush, round and fleshy, with layers of sweet, ripe, peppery fruits and earth. There is no reason to age this any longer. Plush, lush and voluptuous, this fully mature wine seals the deal with its fresh, sweet, dark cherries, plum, spice and earthy, elegant character. Licorice, smoke, fresh herbs, jammy kirsch, stone, smoke and black cherry liqueur aromas produce an inviting perfume. Deep in color, full bodied, rich and powerful, this fleshy wine ends with a black cherry, pepper and garrigue filled finish. This is still young, but I am not sure this is going to improve much. Aromas of blackberries, herbs, spices and cherries. Great palate presence delivering layers of luscious ripe Grenache. The last bottle from my case was delicious. There was sweet, ripe, black and red fruits, earth and animal scents, lush textures and a long, earthy, peppery, black cherry finish. This is a rich, full bodied, voluptuous, open Chateauneuf du Pape that is drinking great today. Pepper, smoke, black raspberry jam, spice and garrigue aromas are in full force. The wine ends with a long, delicious, ripe, sweet, dark berry finish. This was the penultimate bottle from the case and every bottle has been great. Rapidy fading, there were more secondary notes of barnyard and earth than fruit. This is drying out and needs to be consumed. Light red summer fruit and peppery spice notes, coupled with a medium bodied, elegant style make this a nice, fully mature Chateauneuf. The color is raspberry with a rusty tint. The nose was simple with spices, herbs and red fruit. Really nice mouth entry and a short red fruit finish. If you like a page in The Wine Cellar Insider, please link to it! All material on this web site, including but not limited to written articles, tasting notes and photographs are the exclusive property of Jeff Leve and may not be copied, used, or reprinted without written notice and must be properly accredited with links to the appropriate page where the material was first published in The Wine Cellar Insider without exception to Jeff Leve/The Wine Cellar Insider. © Copyright 2010, 2011, 2012, 2013, 2014, 2015, 2016, 2017, 2018. Site design by Chris Schendel.